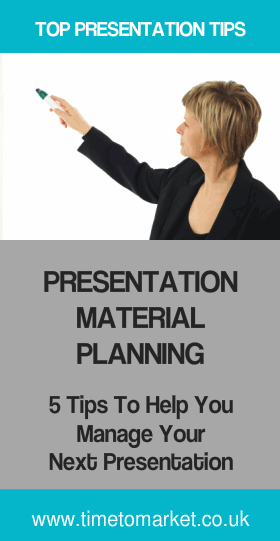 Your presentation material planning is an effective first step to getting your presentations just right. That’s because your choices will help you to engage with your audience. So it makes sense to think about your presentation material, particularly if you want to vie for the title of world’s best presentation! When you use the right material it will help you to convey your message as you present. Because your audience will respond to good material. That’s a fact. So, you have some choices and some decisions ahead. Your PowerPoint presentation slides might be the very first thing you work on. Just remember to keep things simple. So, you could consider these presentation design choices to help you. Videos and Multimedia work really well in a PowerPoint or Keynote presentation. However, do make sure that the quality is top drawer. And also check the media applications are loaded before you actually start the presentation. Then you are ready. Whiteboards and flip-charts might seem old-fashioned. Don’t believe it. So, use them. Then inject some passion into your presentation material and watch the results. Just amazing. Props are a key presentation aid. So, think hard how you can use them when you have to present. Because they can be very useful when you want to explain something or get your audience involved. Keep your handouts to the end of your presentation. Thus, you aim for your audience to be a watching and listening audience and not a reading audience. Don’t print your slides, if you have used them. So, aim to prepare something else. Perhaps, a one-page summary of your presentation would be enough. Some easy pointers showing you how to plan your presentation materials. Aim to use top quality multimedia in your slides. Whiteboards and flip charts work every time so be confident with them. Use props to help you demonstrate products or features. Keep your handouts to the end of your presentation. You can learn more skills and techniques with a public presentation training course at one of more than 40 training centres in the country. Alternatively, why not consider a one-to-one presentation coaching session. Or, perhaps a team-based training event. Please don’t hesitate to get in contact.